Hey guys. I hope you enjoyed the new Youtube channel. Although I will not post too many videos for it, I will try to make the videos interesting. I also would like to introduce the new ZeldaFacts logo. It's not too great, but it's the best I can do. If anyone has any thoughts on it, contact me. But for now, let's discuss the Skull Kid. A skull kid is presumably what happens to a Kokiri who gets lost in the Lost Woods, so Skull Kid was a Kokiri. 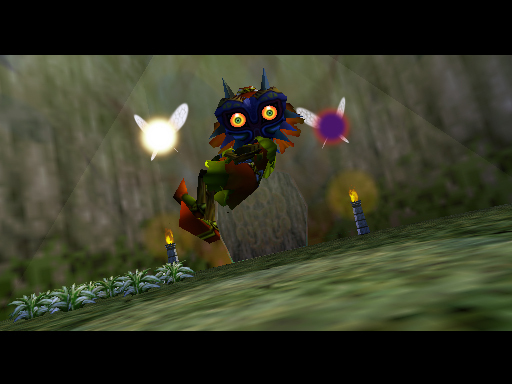 It is also hinted that Skull Kid is in Ocarina of Time and knows Link. 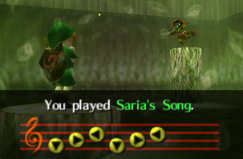 The proof is that in the beginning of the game when Skull Kid attacks Link, he says "This guy... well, that shouldn't be a problem". He also says "you have the same smell as the fairy kid who taught me that song in the woods" to Link. Skull Kid clearly recognized Link. He also seems to have a liking for masks, as shown in both games, when buying the skull mask from Link and stealing Majora's Mask. In Ocarina of Time, he also says he wants to be different, which may be one reason for causing mischief. All in all, Skull Kid is mischievous, but not evil. Majora's Mask possessed him and made him what he was in the game. Although Skull Kid originally came from Hyrule, he may have found Termina before Link, befriended the fairies and giants, and been abandoned by the giants. Skull Kid may seem to be a strange and mysterious character, but if you pay close attention (as I did), you can figure out exactly who he is. Remember to follow the blog and subscribe to the Youtube channel, and make sure to read next post, which will most likely be about Termina. I believe this. All the prof. is there.